Traveling in Mekong Delta, you should not miss to visit Chau Doc which is a small town of An Giang Province. Chau Doc Town is located near the Cambodian border, so it is a place where has mixing of various cultures and many unique outdoor activities. Also, this multicultural land has a convergence of essence, beliefs, way of life and work of the Kinh, Khmer, Cham. Visiting Chau Doc, there are many interesting experiences that you should try once. 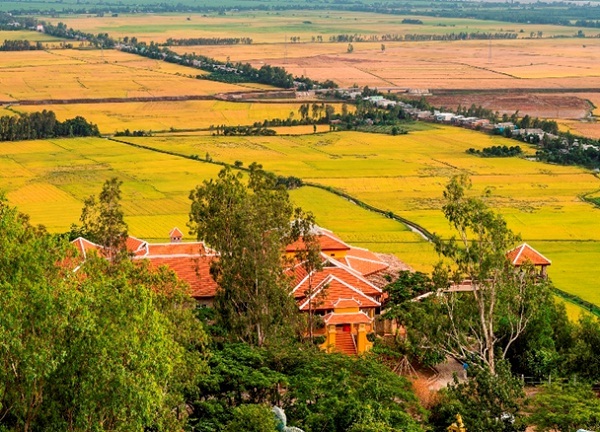 Travelling almost 6 kilometers to the west of Chau Doc Town, An Giang Province, you will have a chance to view the 230 meter-high Sam Mountain with beautiful landscapes and many historic remains. The mountain does not only offer beautiful landscapes, but also is where many historic remains deeply loved by the inhabitants of Nam Bo plain are located. Ba Chua Xu Temple, Tay An Pagoda, Thoai Ngoc Hau Tomb, Tao Ngo Garden, and Bach Van Hill are among the famous sites to visit near Sam Mountain. To the top of the mountain, there is a shrine with good views of the surrounding countryside. One experience in Chau Doc that certainly makes visitors be excited is sitting on boat to explore daily life of the local. Draped along the banks of the Hau Giang River, Chau Doc sees plenty of travelers washing through on the river route between Cambodia and Vietnam. A likeable little town with significant Chinese, Cham and Khmer communities, Chau Doc’s cultural diversity – apparent in the mosques, temples, churches and nearby pilgrimage sites – makes it fascinating to explore even if you are not Cambodia-bound. Taking a boat trip to the Cham communities across the river is another highlight, while the bustling market and intriguing waterfront provide fine backdrops to a few days of relaxation. On a traditional boat, visitors will be visiting to experience a part of life of local people along the Mekong River: floating markets bustling with canoes or boats loaded with vegetables, fruit or floating fishing village with hardworking people. Located around 10 kilometers from the Cambodian border, Tra Su is a specialized forest stretching out 1,500 hectares, which connects to other destinations such as Cam Mountain, Sam Mountain, Tuc Dup Hill and many others. This forest has a lot of potential to develop ecotourism, outdoor activities, and exploration as well as giving scientists a chance to learn and research the local environment and typical ecological system of the Mekong Delta. The most interesting feature here is that tourists travel by motor-boat or dinghies as they weave through the forest. 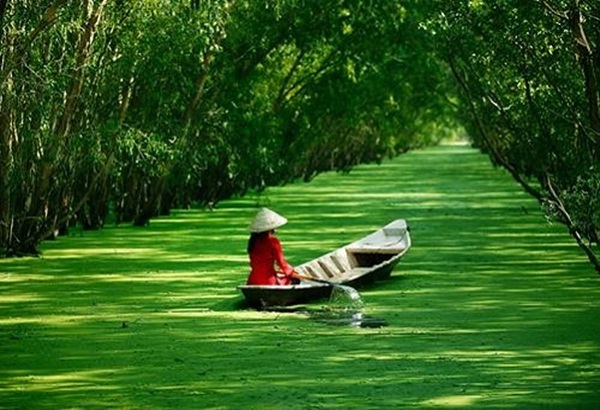 Passengers will enjoy enormous emerald-green duckweed that blankets the water’s surface, as well as flocks of white storks that perch on cajuputs together with many kinds of birds, animals and fish. Sometimes, the boatman stops the boat and shows tourists some of the huge beehives that rest on the top of the trees. After sitting in the motor-boat for 40 minutes to contemplate the natural sights, travelers will take to the rowing boats or dinghies to see birds and storks return home and build nests. 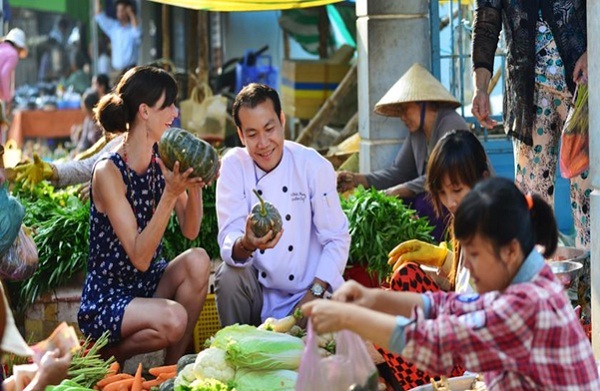 Travelers will have the opportunity to come to a culinary journey with cultural and historic identity of Vietnam by visiting peaceful Cham village and discover recipes of some featured dishes which are not known by many people. This special journey will lead tourists to Chau Doc market to select ingredients and follow canals along the Hau River to the peaceful Cham village where interesting lessons begin. In particular, travelers can have diner before returning by “xich lo”, a unique traditional vehicle at Victoria Chau Doc hotel. 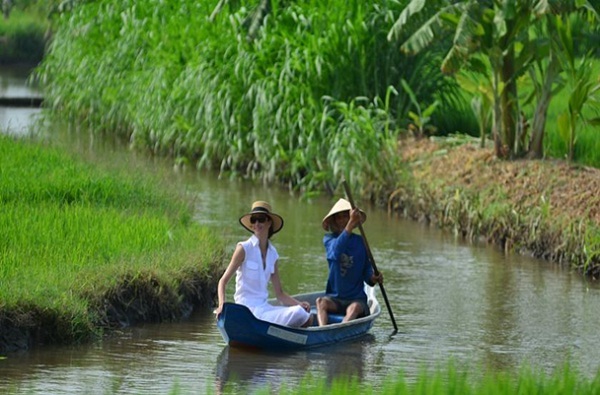 Traveling in Chau Doc and trying these interesting experiences will make chances to learn more about unique culture of the Mekong Delta and make your Mekong Delta tour more wonderful.